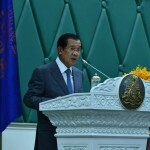 Cambodian government offers 120 buses for the general public to ride for free for a week from 12-18 April during Khmer New Year Festival, according to Prime Minister Hun Sen on Thursday at the solidarity meal with approximately 4,000 local athletes at Koh Pich. Buses are set to run on the national highway. No. 1, No. 2, No. 3, No. 4, No. 5, No. 6, No. 7, No. 8. 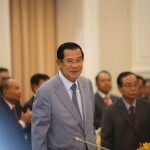 Cambodian Prime Minister Hun Sen announced that Cambodia would consider to join Trans-Pacific Partnership (TPP) if all ASEAN members reach consensus, speaking at the 18th Royal Government-Private Sector Forum held Friday at the Peace Palace. Cambodian Prime Minister Hun Sen ordered commerce minister Pan Sorasak to consider on filing complaint to World Trade Organization regarding EU’s tax imposition on Cambodian rice, speaking at the 18th Royal Government-Private Sector Forum held Friday at the Peace Palace. 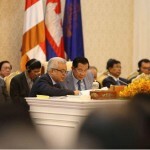 “CRF requested for complaint to WTO […] the tax imposition is a violation against Cambodia,” stated the Premier. 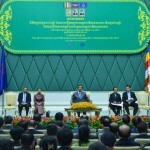 Cambodian Prime Minister Hun Sen said that following the business and investment reforms, the kingdom’s private sector indirectly earns USD 400 million from cost effectiveness and that Cambodia could survive without EBA, speaking at the 18th Royal Government-Private Sector Forum held Friday at the Peace Palace. 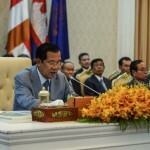 Prime Minister Hun Sen, on Thursday, recommended eight policies to ensure labor rights in Cambodia in accordance to international conventions, speaking at the 100th Anniversary of the establishment of International Labor Organization (ILO) at the Peace Palace Phnom Penh. 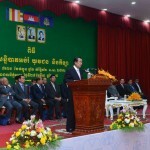 At least 99.3 per cent of Cambodian people are employed, an equivalent to 10 million labor forces, Prime Minister Hun Sen said Thursday at the 100th Anniversary of the establishment of International Labor Organization (ILO) at the Peace Palace Phnom Penh. 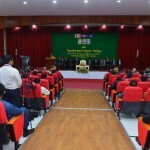 Cambodian Prime Minister Hun Sen recommended five policies for the development of Cambodian education sector, addressing Wednesday at the annual meeting of Education Ministry. 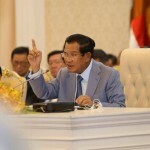 Cambodian Prime Minister Hun Sen announced to allocate larger budget to the Ministry of Education, Youth, and Sport to increasingly deploy teachers nationwide in response to retired teachers, addressing Wednesday at the annual meeting of Education Ministry. 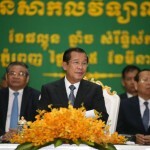 Cambodian Prime Minister Hun Sen urged electric generator salespeople to ensure reasonable price during the electricity crisis, addressing Wednesday at the annual meeting of Education Ministry. Cambodian Prime Minister Hun Sen stated that the Turkey’s electric-generating vessel will arrive Cambodia tomorrow for the three-year term supply, addressing Wednesday at the annual meeting of Education Ministry. 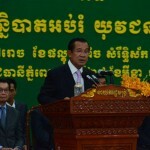 Cambodian Prime Minister Hun Sen called on citizens to catch rain by using reservoirs and urged the authorities to solve water crisis for people facing crisis, speaking at the graduation ceremony of Phnom Penh International University on Monday. “The rain will not last long. 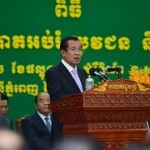 Everyone should catch rainwater and use it later during water shortages,” said Prime Minister Hun Sen.
Cambodian Prime Minister Hun Sen urged W&D (Cambodia) Co., Ltd. to accept 100 of its employees to return to work, speaking Monday at the graduation ceremony of Phnom Penh International University. “I urge W&D to welcome back their former employees,” the Premier spoke before 1,245 graduates. 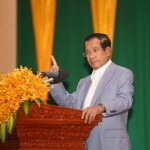 He also advised garment workers not to demand too much, as incited by some groups [CCAWDU].